Home Science Yellowstone volcano erupt: What will happen if Yellowstone explodes? Yellowstone volcano erupt: What will happen if Yellowstone explodes? What if the Yellowstone volcano erupted? Researchers are closely monitoring the deadly Yellowstone Volcano after confirming the first eruption of the nearby Steamboat Geyser in five years which signalled increased activity in the volatile region. The experts said Steamboat – the world’s tallest active geyser with recorded eruptions as high as 300 feet — does not erupt predictably or often. But it blew last week amid fears that Yellowstone could be on the brink of cataclysmic eruption after a magma “anomaly” stretching across the country under the deadly super volcano was discovered. 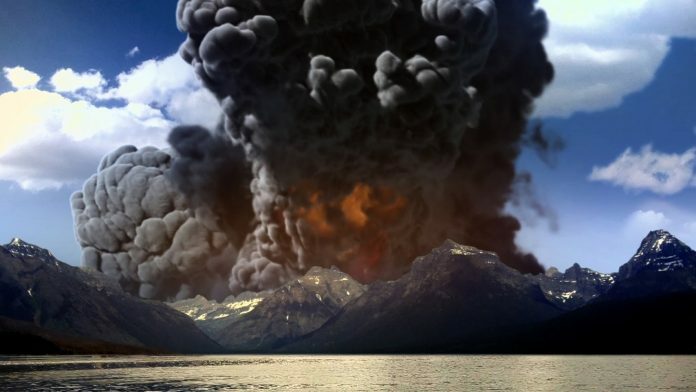 Wendy Stovall, the deputy scientist in charge at the Yellowstone Volcano Observatory, a branch of the United States Geological Survey, said the Steamboat eruption was confirmed both by data collected on-site and later by observation by National Park Service staff. The eruption occurred at 5.30am on Thursday March 15. There were no witnesses to the eruption but the activity was picked by remote sensors place around the Norris Geyser Basin. Park Service staff went out the following day and confirmed the geyser was still producing a “vigorous” steam phase that was also observed on Monday but Dr Stovall could not confirm the steam phase had been continuous all that time. “Crustal deformation refers to the changing earth’s surface caused by tectonic forces that are accumulated in the crust and then cause earthquakes. The YVO measures the temperatures of several different features at Norris and the readings are then used to measure the seismic situations across the entire Yellowstone caldera. Dr Stovall said: “This has no bearing on the magmatic system under Yellowstone. “Volcanoes all over the world have hydrothermal systems. The last major Yellowstone eruption was registered 630,000 years ago and many now fear a deadly eruption is long overdue. Earlier in February more than 200 earthquakes rocked Yellowstone over a 10 day period, according to the US Geological Survey (USGS), sparking fears of imminent eruption. However the USGS assured the residents of the US East Coast, there was no immediate indication of danger.